Recipe makes approximately 2 quarts. The sauce freezes well, so you can make a lot and freeze it for later! Or, you can easily halve the recipe. In a large skillet with high sides – or a large pan, such as the size you boil pasta in, heat 3 Tbs. olive oil – add 3/4 lb. ground beef and 3/4 lb. 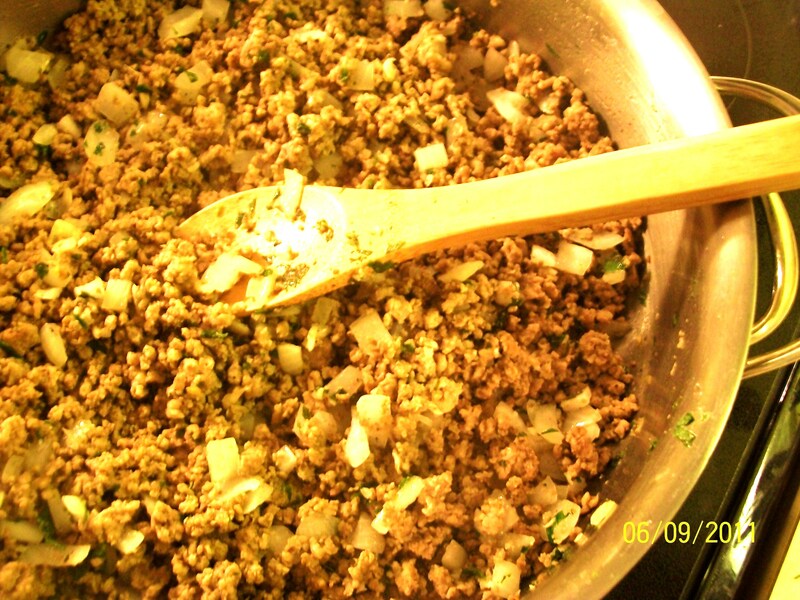 ground pork. Break up the meat as it cooks, and continue cooking until juices run clear. Continue cooking until all liquid is absorbed and meat is browned a bit. Add chopped onion, HALF the chopped parsley, HALF the chopped basil, 1/2 tsp. salt and 1/4 tsp. pepper. Continue cooking until onion is translucent. 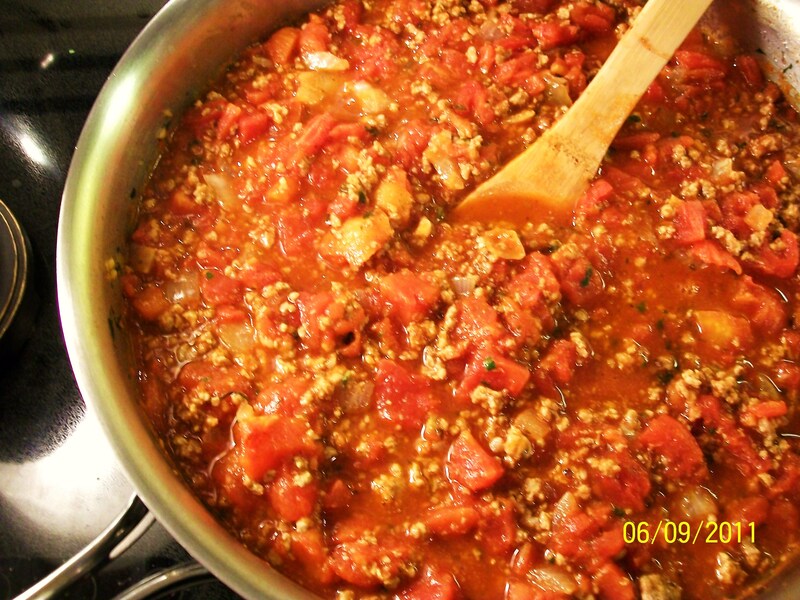 Add tomato paste and mix until paste is thoroughly combined with the meat/onion mixture. Cook for another minute, then add the red wine. 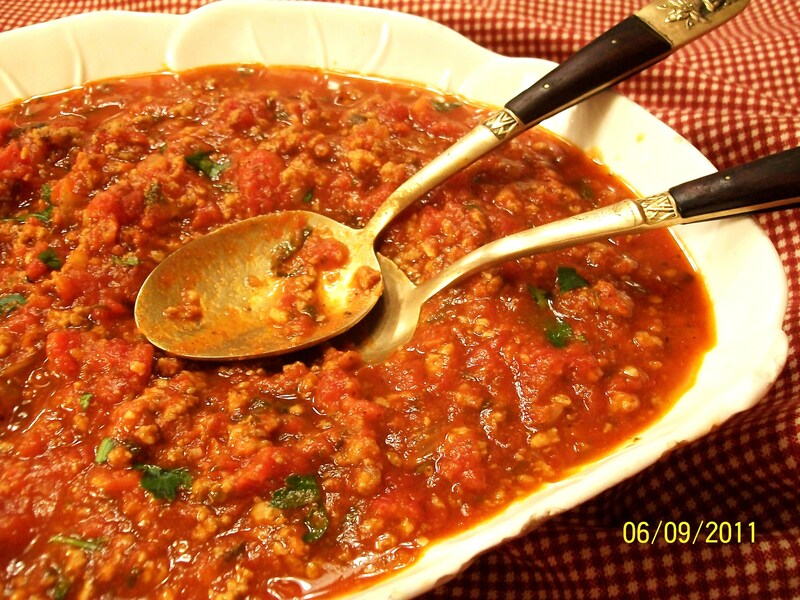 Allow to simmer a few minutes to intensify the flavors, then pour in the two cans of diced tomatoes. 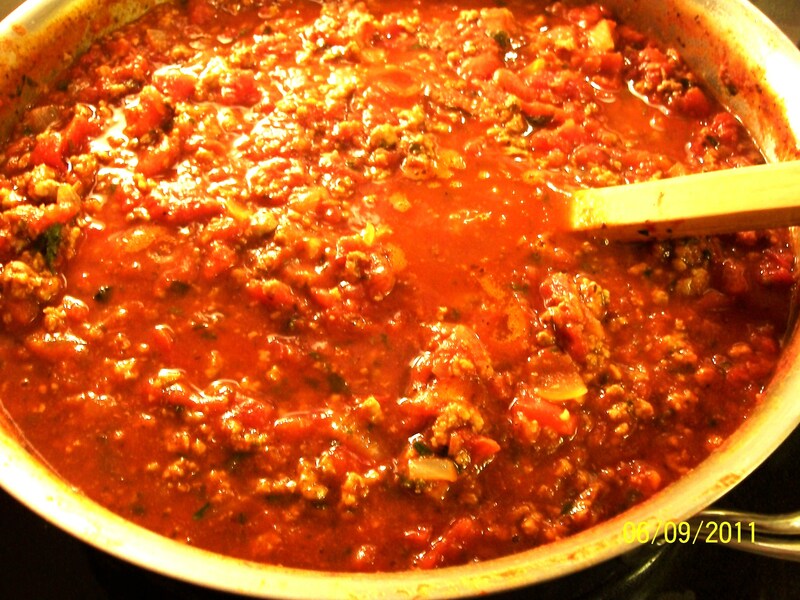 Simmer the sauce – uncovered – for 1 1/2 to 2 hours, stirring every once in a while. ++ If you prefer your sauce thicker, just continue simmering a bit longer. 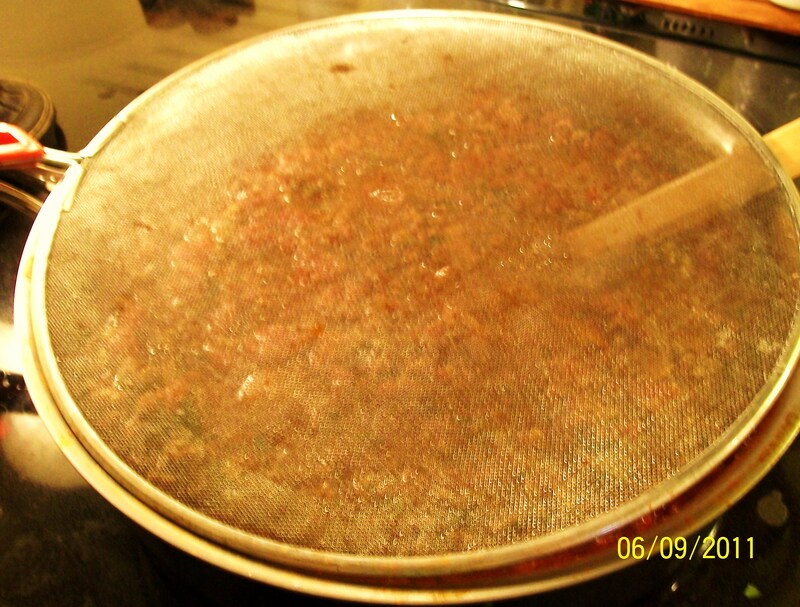 Photo shows Italian Pasta Sauce with Meat and Fresh Herbs – 1 hour into cooking time. Add the rest of the chopped fresh basil and chopped fresh parsley, which will gives you a wonderful burst of flavor. ++ The diced tomatoes may still be a bit “chunky at the end of the cooking time. If you prefer a smoother sauce, you can “mash” the the diced tomatoes down a bit with a potato masher, which is what I do. Remove the sauce from the heat. Pour yourself a glass of some of that red wine and enjoy ! Previous Post Stuffed Shells Florentine – Cook in Oven – OR – Outside on Your Grill ! Thanks so much ! I’m long overdue in posting but I’ve got four new recipes photographed and ready to be entered – another pasta one ’cause pasta (in any form) is always popular, an lovely Italian bread and two appetizer recipes!! I just checked to see if anyone had looked, at this odd hour, at the recipes I’d just posted. And – indeed – someone had checked out the new recipes and a few others. Quess what – they were referred from your blog – and the link was your recipe for Salami French Bread Pizza ! ; o ) Talk about ironic !! Looks divine! Love how hearty this sauce looks. Delicious Cecile. I was certainly hoping that you wouldn’t think that I somehow “mangled” your wonderful, traditional family recipe! I’d love it if everyone who sees this post “checks out” your blog because I love the recipes – and your stories about your family ! I really am glad that you tried and enjoyed this sauce, Cecile and I’m certainly honored that you would blog about it, too. Thank you so much!